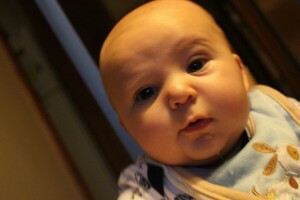 Earlier this week, Wes officially turned 3 months old. (But he’s almost 14 weeks old, go figure.) I can’t believe that I’ve had this child living with us for the length of a trimester in pregnancy! It goes so much faster when he’s visible and breathing outside your body. 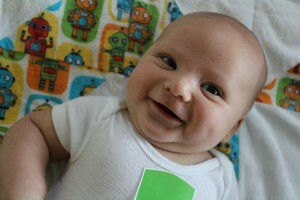 He’s chunky-cute and steals my heart through his goofy grins and batting eyelashes. His thunder thighs are almost larger than my upper arms, if that’s even possible. (And how come I’m not sporting super biceps lugging around 20+ lbs when he’s in his car seat?! Not fair.) He coos, squeals and laughs at my jokes. He’s pretty amazing, except he doesn’t sleep. Unless I’m holding him or letting him nurse, this baby won’t sleep. We recently transitioned him into his crib from our room, and it went beautifully for the first week or so. Then he decided that swaddling is for babies and his arms MUST be kept out. This was fine until he continually woke himself up by flailing his arms and couldn’t get himself back to sleep. Since then, he’s decided that it’s not cool to sleep flat on his back or in his crib. He’d much rather be the warm, cozy arms of Mommy all night long. Until then, enjoy these super cute 3-month photos! Notice the lack of smile. He’s so studious about the world these days; the camera was too fascinating to smile at. 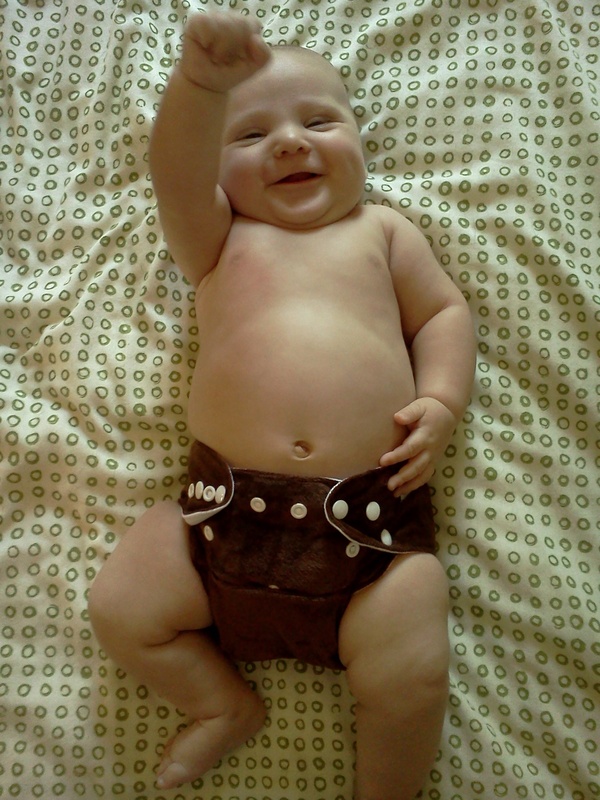 For the last 3 weeks, we’ve delved into the world of cloth diapering (also known as CDing). During pregnancy, I researched so many web sites, facebook pages and blogs to figure out what would work best for us while still being not so intimidating. I wound up with a stash of pretty good variety, and I’ve been anxious – but kinda scared – to dive in to this booming industry. Now that Wes is a whopping 17 lbs at nearly 3 months, I felt silly putting him in disposables when I had this fairly large cloth “wardrobe” at my fingertips. After a few weeks and several washings, here’s what I’ve learned. Also get: Diaper pail liners and wet bags to throw in dirty dipes. They can be washed along with the diapers. These sites seem to have the best deals and coupons: Cloth Diapers, Inc, Kelly’s Closet, Diaper Junction and Cloth Diaper Outlet. Many of them have free shipping after a certain dollar amount. 2. Then, you’ll need to purchase additive-free detergent (I recommend Rockin’ Green or Country Save) because even detergents like Free & Clear have chemicals that can build up on the diapers over time, making them REPEL water. Yikes. Wash your diapers several times before wearing to make them extra absorbent. Do a cold water rinse first to get the nasties out. Then wash with 2-3 tb of detergent in hot water and double rinse. I throw my inserts in the dryer, but hang dry the outer shells. For stains, the best solution is drying them in the sun. I haven’t yet done this, but everyone says it does an awesome job. 3. Avoid fancy diapers. Seriously, it’s for keeping a bum dry and poop contained. 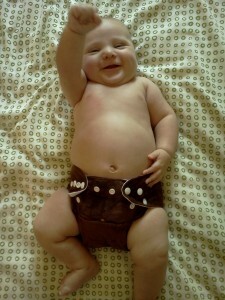 I’ve felt the pang of what’s called “cloth diaper addiction.” Some moms can’t stop buying diapers. I’ve had to reel myself in from daydreaming about cute patterns and a large stash. Sheesh! I found a bunch of Flip inserts on Craigslist, and they’re great to just throw in a waterproof cover (we use Econobum and Gro-Via shells). I like this option best because you can reuse the shell several times and just change out the insert. I also use the old fashioned flat cloth diaper in these. We have a hodge podge of pocket diapers (BumGenius, FuzziBunz, Charlie Banana, Alva Baby, Just Simply Baby), which are basically the cloth version of a disposable. While most families seem to like these best, I don’t so much. I just think you’ll need to get a TON more of these diapers, since you have to replace with a whole new diaper every time. If I just had pocket diapers, I think I would opt for SunBaby, which are good quality diapers for a fraction of the cost of name brands. Two friends of mine use these and have been really happy with them. 4. Read up! I thought all my research had given me plenty of knowledge about cloth diapering. Not so! I went ahead and ordered the book, Changing Diapers, and I learned WAY more than I thought. Who knew you shouldn’t put microterry right against skin? 5. It’s really not as scary as I thought it would be. I’ve probably bored you to tears on my CDing adventures, but it’s certainly an adventure for us. I do think we are saving quite a bit of money by not buying so many ‘sposies, and our water bill hasn’t gone up as much as I thought it would. Of course, it’s always nice to know that we’re doing just a small part to keep our planet green for Wes’ kids, too. Wes loves to hold his head up as long as possible in order to achieve a 360 view of his world. Everything is fascinating to him. Well, at least for a few minutes. He gets bored quickly and wants me to entertain him with new objects, funny faces and silly noises. We carry conversations back and forth. Diaper-changing time is his favorite time of day because he has a fantastic view of his favorite mommy. He gets frustrated with himself when his head gets heavy, his hands don’t cooperate and when his eyes droop with sleepiness. He’s already forming into a little perfectionist who doesn’t want to miss a beat. Public places seem to be where he’s most happy, and he loves the outdoors. He adores his daddy who can make him laugh harder than anyone else. What an amazing little person we have in our family!